Today's post is all about my favourite winter lipsticks. This post is quite similar to my winter make-up staples, so I'll be sharing with you the lipsticks from that post (click here to read). Winter is all about red and purple lips for me. A favourites lipstick post would not be complete without mentioning MAC. Russian Red is a staple for me as well as Rebel and my new addition Diva. Diva is a deep red and it looks gorgeous this time of year. 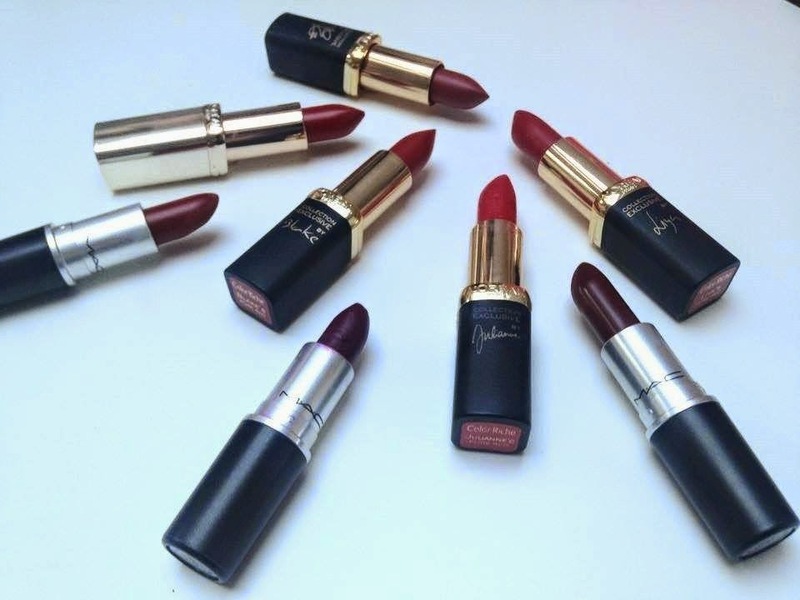 L'Oreal's Collection Exclusive Pure Red's are some of my favourite lipsticks. If you're looking for red matte lip in different tones definitely check the L'Oreal counter out! There are now five red's in the range (I'm missing Eva's) but there's a shade for everyone (I can't help myself so I bought four...) and red lips always look classic in the winter months. What are your favourite winter lipsticks? Rebel is so gorgeous, i need to get Diva ASAP!